This Apprenticeship is about providing support in the classroom. After all, teachers aren�t the only ones who make a difference to learning in schools. Learning support staff, such as teaching assistants, plays a vital role in today�s classrooms by making sure students get the most out of their lessons. They work with teachers, carry out duties like lesson preparation and work with small groups or individuals, allowing the teacher to concentrate on teaching the class. Some learning support staff specialise in areas like music or special needs. As an apprentice, you�ll work under the close supervision of a class teacher. Your duties will vary depending on how the teachers you work with plan their lessons and handle day-to-day classroom activities � however, you could find yourself supervising arts and crafts activities, helping with outings, or reading to the class. The Advanced Level Apprenticeship adds more responsibility to the role. 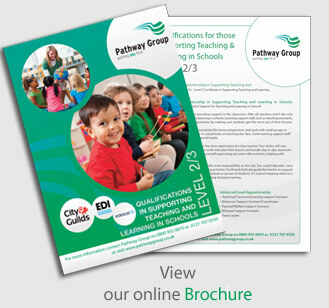 You could help plan, carry out and evaluate a wide range of learning activities. You�ll work both alongside the teacher to support classroom activities and alone with individuals or groups of students. It�s a good stepping-stone to a foundation degree or Higher Level Teaching Assistant training.